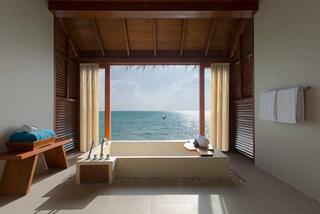 Sometimes all you need is a warm bath with a view to rejuvenate and relax on vacation. Here is a list of the coolest hotel bath tub views, ranging from scenic city tubs to romantic tubs over the ocean. You can be surrounded by open ocean views at the stunning Huvafen Fushi in the Maldives where the bathroom is built on stilts over the water. Or check into a hotel on a cliff for similarly spectacular water views. Next Read: 12 Awesome Beach Dinner Spots. 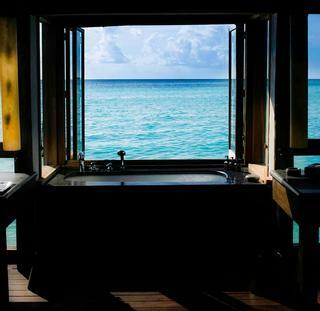 This elegant tub at Huvafen Fushi Maldives is perfectly positioned to offer the best ocean views. 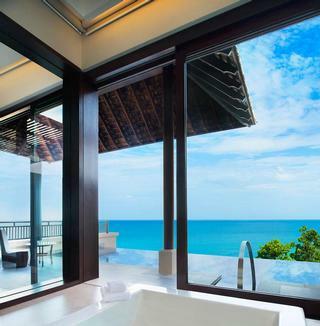 From this square tub with modern lines at Vana Belle Koh Samui you can see the vanishing edge pool, the ocean and the sky in the distance. 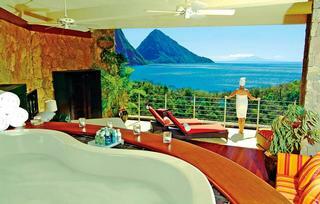 This tub at Jade Mountain is big enough for two, a perfect spot for a honeymoon with spectacular views of the famous Pitons in St. Lucia. Open the window and feel one with the ocean as you take a soak in the privacy of your own overwater villa at Gili Lankanfushi Maldives. 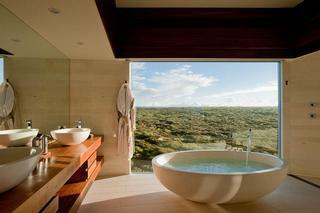 Southern Ocean Lodge on Kangaroo Island in Australia was built to offer guests some of the most spectacular scenery. This designed tub is huge, offering plenty of space for two. You can admire the view through a giant floor-to-ceiling window. 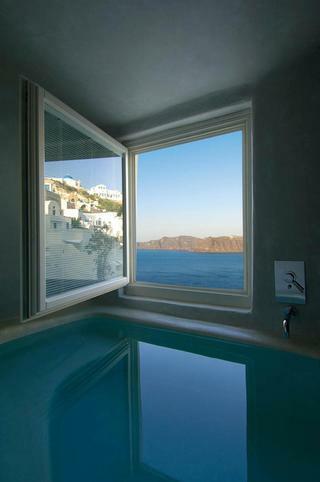 This unique tub at the Mystique Resort in Santorini lets you watch the Greek Islands and the ocean below as you take a relaxing soak. 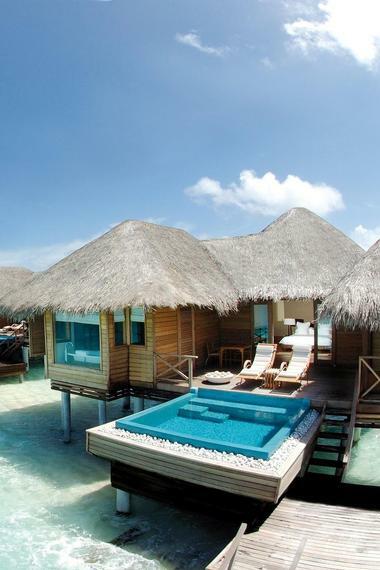 This huge rectangular tub is built on stilts over the water at Anantara Dhigu Resort in the Maldives. 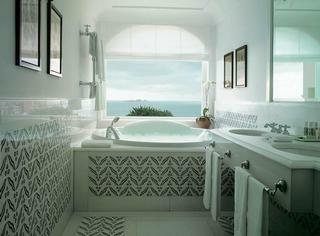 Have a romantic couples' soak with a view of the ocean or enjoy the spacious tub all by yourself. This romantic bathroom at Le Sirenuse is decorated with designer Italian tiles and is perfectly positioned next to a large window overlooking the Adriatic sea in Italy. 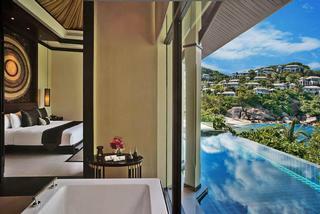 Banyan Tree Samui in Thailand offers vacationers tubs with spectacular pool and ocean views just steps from the bed. An oversized oval tub next to a floor-to-ceiling window at White Pearl Resorts in Mozambique. 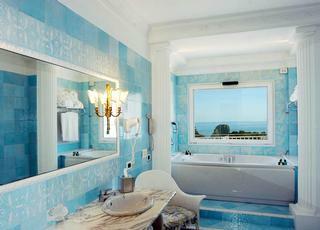 Bathroom with custom blue tiles that match the sea at Grand Hotel Quisisana are inviting and luxurious. 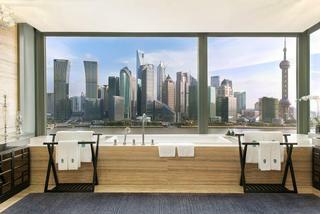 Huge windows frame the large rectangular tub at Banyan Tree Shanghai on the Bund. Enjoy a relaxing soak with incredible views of the city. Daytime and nighttime views are equally impressive. 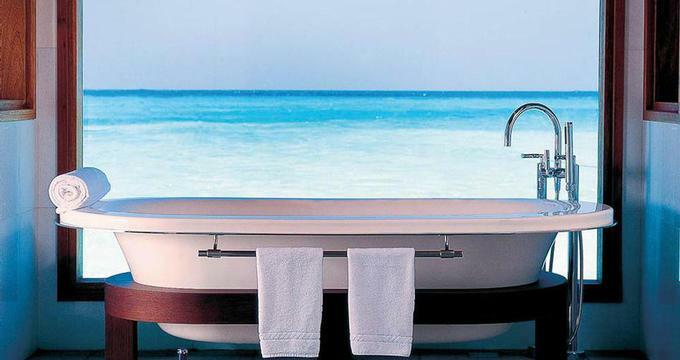 Sip champagne in the overwater tub at Coco Bodu Hithi Maldives with views of the private pool and the blue lagoon. 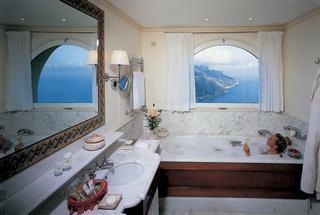 Enjoy a romantic bath with a view of the Amalfi Coast in Italy at Hotel Caruso Belvedere. The bathroom has plenty of natural light to let you relax in style. 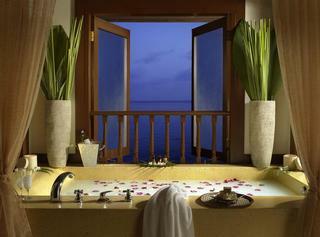 Stylish yellow tub with rose petals next to an open window over the ocean at Pangkor Laut Resort in Malaysia. Set on a hill overlooking a wildlife preserve, this tub at Sir Richard Branson's Ulusaba faces huge windows with unobstructed views.